Twiggy is a pirate on the Viridian, Midnight and Hunter oceans, and made short appearances on the Sage and Malachite oceans. He began playing in December 2003 and retired in the early months of 2010. Twiggy arrived on the Midnight Ocean during the month of December 2003, in the port of Epsilon. He spent over a year with the Blood Brothers of the flag Ruby Phoenix, which was the very first crew he jobbed for. A pirate by the name of Buri gave him his first sword for free; a red saber. He did so to ease the disappointment of a lack of crafting puzzles at the time. Twiggy focused his attention elsewhere and sailed every morning from Hephaestus' Forge to Namath Island. 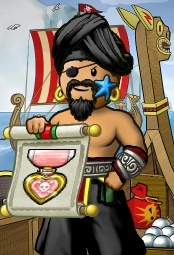 He would then forage wood (prior to release 2004-12-15) and sail it back for profit, defending his precious cargo with his new sword and a few loyal swabbies. As the Viridian and Cobalt oceans were announced, Twiggy knew that he could not make a name for himself on Midnight. He would go against popular choice and move to the Viridian ocean, rather than Cobalt. He was confident that Viridian would be his home for a very long time. His return to Midnight, two years later, was solely based around the Notorious Fandango reveulition. Twiggy idolized them. Looseweed and the war against Superlemon Krakatoa inspired Twigs to improve every facet of his game. He spent time in both Fandango Familiars and Hell Fire for Hire, and even navigated in a few blockades for them. He was also made governor of Turtle Island for one hour. This is Twiggy's favorite memory. Twiggy remained with Fandango until the day of their disbandment. The vast majority of Twiggy's time in Puzzle Pirates was spent on the Viridian Ocean. He was very fortunate to witness, let alone have control over, 2006; arguably the best year in the history of doubloon oceans. In this year many Viridian blockades were near guaranteed to be heavily influenced by Maharet, Twiggy and Kalani's Requiem Alliance, and the powerhouse Vanguard Alliance run by Calais, Bigbertha and Ochubb. They were always enemies, but with such respect and friendship started to form in small groups between the two alliances. This helped to add a competitive edge. However, Star Explorers' inexperience started to show as loyalty was questioned and fewer flag members trusted each other. Twiggy cherished his friendship with Vanguard and Pay for Play, but this was the turning point and the flag began to decline. The royals could not trust their king. Twiggy stepped down as king shortly after being accused of losing Terra VI intentionally by co-leaders Kalani and Maharet. He then created the flag Christianity. Over the two separate tenures of this flag, 152 flags were declared on and a full state of war was achieved with 17 flags. The sinks were even more drastic, totalling 2,318,000PoE in damages in the form of 29 ships, with only three Christianity ships hitting Davy Jones Locker, serving patronage to the legendary days of the Black Sheep Brigade. This stunt resulted in a large mass of pirates referring to Twiggy as 'God', even across other oceans. Twiggy has navigated in upwards of sixty-five blockades, and has been admiral of fourteen. He took pride in a hands on style that allowed him to help pick up the slack whenever a blockade team member struggled. He has been the governor of Terra Island, Dendrite Island and Viridis Island. Twiggy has been the captain of several crews, including Forsaken Anarchy, Purple Haze and Lords of Dogtown (twice). None of these succeeded in any particular way, which left him believing he was better suited to leaving that role to somebody else. Giving it one last attempt Twiggy created the Azure Knights on June 14th 2007. The Azure Knights are a tribute to his original Midnight flag, Ruby Phoenix. On June 27th 2007, the flag Cervantes de Leon was created with Twiggy as monarch. With the help of Cherylshubby and many others, this flag rose to the top 10 famed flags within two weeks. The Azure Knights remain open to this day, now serving solely as a memory; the crew's original purpose. Twiggy owns a cottage on Carmine Island, and could usually be found there Swordfighting or playing poker. The origin of Twiggy's name came from the popular bass player, Twiggy Ramirez, a former member of Nine Inch Nails. He set a new record on Viridian, being purchased for 303,000PoE in an officer auction organized by Requiem. Not a member of the flag, Twiggy was a last minute addition to the event. The amount was quickly surpassed three weeks later by Cyndiepet. December 22nd 2006; a drunken Twiggy sells his black painted war brig, renamed to 'Streetlight Manifesto', for 400,000PoE in November. It is renamed the 'Mad Cow'. After a declaration of war by Christianity, the Mad Cow is sunk by a sloop. The sloop used was a Christmas gift that had not been given yet to the recipient. This page was last modified on 17 September 2010, at 01:23.